Have you ever snapped a picture that was so creative and beautiful, you thought this totally belongs on my fingernails? Ever wondered if you could get that awkward photo of your cat sleeping upside down on your boyfriend's head archived forever as nail art? Well now you can! 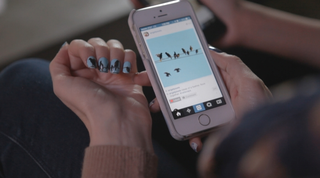 Thanks to NailSnaps, an app currently raising funds on Kickstarter, you can turn any of your photos "into one-of-a-kind nail polish stickers you can apply yourself in minutes for custom, wearable art." As the Daily Dot points out, this putting pictures of stuff on other different stuff trend is...interesting. Take a moment to savor the apex of the "putting Instagram pictures on stuff" trend. (Notable former entries include the company that prints Instagram pictures on marshmallows, the company that prints Instagram pictures on wrapping paper, and the company that prints Instagram pictures on throw pillows, coin purses, and tote bags.) Sure, all that stuff was great (by great I mean impossibly unnecessary kitsch) but it did not involve physically attaching a printed-out version of an image from your Instagram feed to your person, and so they lose the Superfluous Printable Instagram Photo Company Olympics. It looks like they're about halfway to their goal, so if someone wouldn't mind giving them about $25,000 so I can get this cool picture of a salad I had at brunch put on my nails; kthanks.